Farmington Hills, MI… Philips Automotive North America, a division of Royal Philips (NYSE:PHG), is first to market with street legal applications for stop, tail, and back-up lighting with its new line of Philips X-tremeVision LED Exterior Lighting. These innovative Philips X-tremeVision LED Exterior bulb replacements use high-powered LEDs to deliver five times more light output than standard 1156, 1157, and 921 incandescent bulbs, while using 13 times less energy. The extra light output provided by these new LEDs helps increase safety and speeds driver response during braking. Designed as direct replacements for original equipment, they are heat resistant and offer a perfect fit in the vehicle’s existing bulb socket. With a life expectancy of up to 12 years, the new Philips LED lights will last substantially longer than traditional bulbs. The new LED lamps are available in Intense Red for 1156 and 1157 for stop, and tail light, as well as 6000K Xenon White for 921 White and 1156 White for back up light applications. Philips new X-tremeVision LED Exterior line compliments Philips current line of interior LEDs, which are available in both 4000K Bright white and 6000K Xenon white configurations for overhead and glove box applications. 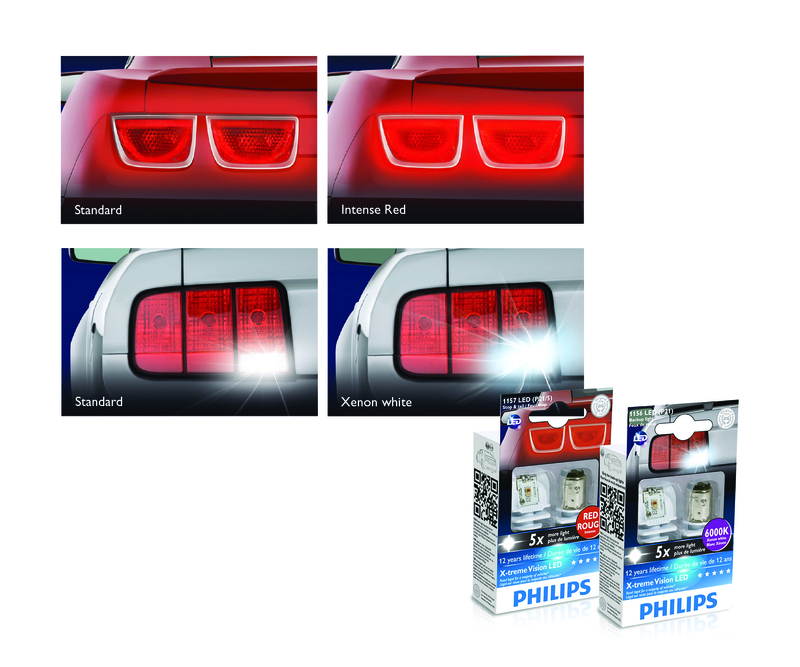 For more information about Philips X-tremeVision LED Exterior Lighting, visit www.philips.com/automotive or call1-800-257-6054. Royal Philips (NYSE: PHG, AEX: PHIA) is a diversified health and well-being company, focused on improving people’s lives through meaningful innovation in the areas of Healthcare, Consumer Lifestyle and Lighting. Headquartered in the Netherlands, Philips posted 2012 sales of EUR 24.8 billion and employs approximately 116,000 employees with sales and services in more than 100 countries. The company is a leader in cardiac care, acute care and home healthcare, energy efficient lighting solutions and new lighting applications, as well as male shaving and grooming, home and portable entertainment and oral healthcare. News from Philips is located at www.philips.com/newscenter.